San Jose Councilman Sam Liccardo calls the move rare. After a year of warnings and complaints, the city has filed 55 criminal charges against the registered homeowners at 536 North 12th Street. The charges range from blight, to diverting solid waste into a neighbor’s property, to diverting water from another neighbor. 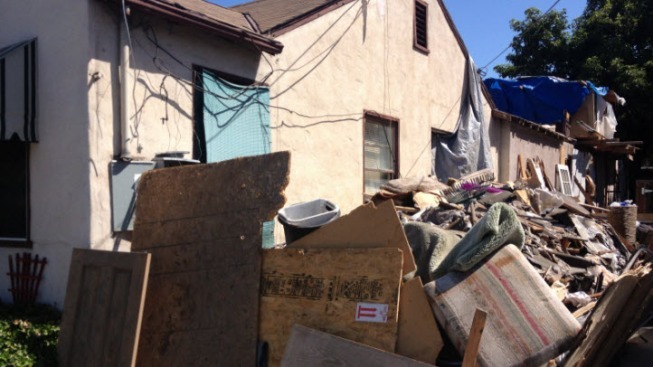 “We were getting a lot of complaints of the piles of garbage on their property, about diversion of sewage, squatters coming in and out, nobody staying here for a long period of time, lots of people leaving the property,” said Liccardo outside the home. The home has turned into a virtual homeless encampment. Aside from the criminal charges, the city also red-tagged a dwelling in the back yard where many people were staying. While we were there, we saw a woman pushing a shopping cart full of junk into the backyard. We asked her where she lived now. “Right there, not where it’s condemned. I live in part of the house that is not condemned,” the unidentified woman said. Rita Marquez is 85 years old and one of the registered owners of the home. Her son-in-law, Robert Marquez, is also on the title. Marquez told us the charges are false and that the city is only harassing them. But he couldn’t deny the fact that people were coming and going at will from the home, people who weren’t paying rent. One of the men who was paying rent, didn’t deny it either. “We were trying to keep people that didn’t live here out. Then there were people that moved in and stopped paying rent, or didn’t pay rent,” said Rickey Bointon. Bointon says the principal owners of the property are elderly, and lost control of who was coming and going. This was just a situation of utter neglect by the owner, and if we didn’t take criminal action, I’m convinced nothing would happen," said Liccardo. City Attorney Rick Doyle said the homeowners could face jail time or a fine or both for the misdemeanor charges. And if they can’t pay the fines, then the city reserves the right to file a lean on the property. ‘’I hope we can use this as an example in other communities throughout San Jose,” said Liccardo. “That when we see utter neglect by homeowners, not care about the communities where their own property sits, we’re going to come after them."